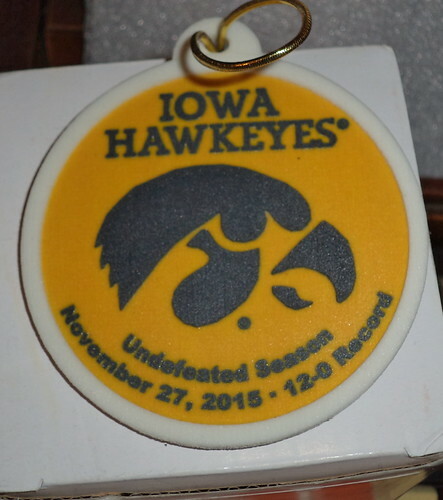 It was a storied season for my Iowa Hawkeyes. The football team went undefeated in regular season play, losing only in the Big 10 championship game and then, very badly, to Stanford in the Rose Bowl. In spite of the embarrassing loss, I'm thrilled with how far they got when even we faithful fans would have been content with a 50-50 season. and have a second one coming. That one does not list the opponent in the Rose Bowl. It's just the logo, Rose Bowl 2016, and a rose. After the horrible game, that's all I want to remember. I also got an ornament. 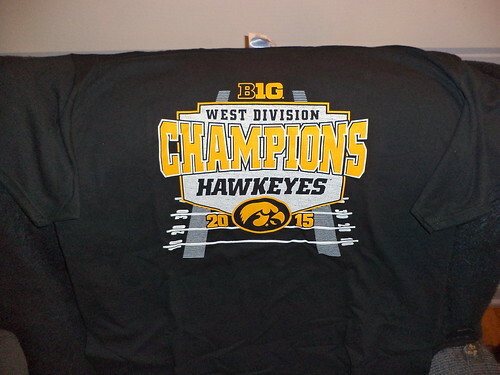 The date referenced is the Iowa-Nebraska game where we finished off the season undefeated. If I had put up a tree, this would have been front and center. I might get an ornament stand and display this. I'm not sure. Lastly, thanks to my mom, I got a poster. 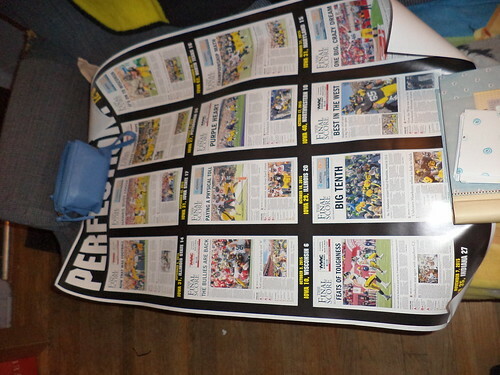 This poster reproduces all the front pages of the sports section of the Cedar Rapids Gazette. The Gazette is, probably, the prime print news outlet covering the Hawkeyes. Toward the end of the season, mom started sending me the sports section so I've read the articles attached to the front covers. Then, when the season ended, she sent an ad where I could order the poster. It was something I had to have. I have a poster frame for this and it will go up on the wall in my office. It's not likely we'll see this kind of skill and teamwork again for a very long time. Iowa has never been undefeated in regular season play. Even in the years where we won the Big 10 title outright, to earn a spot in the Rose Bowl, we had a loss on our record. These guys were overachievers of the highest order. I'm glad I got to see a few of the games and revel in the season. These mementos will remind me of that great event.